Following on with our Insomnia 49 coverage, we sat down with Reason-Gaming's Captain, Kieran 'DreadKnight' Ghatora after their game versus against All authority in the upper bracket semi finals. Venum: Hi Dread, I'd like to start with your loss to aAa, I believe you went undefeated up until facing them and then dropping both games in the best of 3, how confident were you and the team going into one of your toughest games? DreadKnight: We were pretty confident going into the game against aAa, I mean if you're going into games convinced you're going to lose you're definitely doing it wrong! It was a bit depressing losing both games so badly to aAa but are a very solid team and play a style that we struggle against, even when we're playing weaker teams. DreadKnight: Well I mean, DDoSing definitely had it's toll on our momentum as it will always do. aAa really proved their experience right then and there by not being affected at all it seemed by it whereas we weren't really up to our best unfortunately. A major problem throughout the event has been the lack of scrim practice. The internet wasn't working on Friday and then we got a relatively easy group so I feel the lack of recent opponents around aAa's skill worked against us. With respect to the first game, yeah! I was quite happy how we played in that, a few mistakes here and there but despite the gold advantage due to our team composition and specifically where our money was it was really quite even and we may have even taken it. There's no use crying over spilt milk though. Venum: You seemed fairly confident giving the wisp to aAa in game 1, have you guys practiced against him as he is a incredibly strong hero in the current meta. DreadKnight: Yeah, I mean generally we find that we play quite well against wisp, the key is generally to remaining very disciplined against him, keeping good vision up throughout the game and taking only certain fights against him. aAa played very well to counter it though, their dewarding and map control was absolutely insane and for a lot of the game we were in complete darkness which is definitely where wisp shines as you're never entirely sure where you can go and who you can go on. Venum: Well after dropping into the loser bracket and winning yet another game, you have the possibility of facing either Karnage eSports or SmackdownSyndrome, 2 fiercesome opponents, who would you rather face after seeing their performances? DreadKnight: I think we'd rather face Karnage - I feel we can exploit their flaws much better than SdS's and they play a more standard style. SdS run a lot of off-meta strats and can sometimes really catch you out in the drafting phase with their extremely aggressive style. Venum: Being in the lower bracket is also a very risky place with all of the games being BO1, how confident are you guys in making it into the finals from the lower bracket with 2 more games left there? DreadKnight: I mean anything can happen in BO1s so it's very difficult to say we can definitely make it there but then again I'd like to say that we're pretty confident we will. Venum: Well I won't keep you much longer, any final words? DreadKnight: Dave's AntiMage is bad. Would also love to shoutout to our organisation, Reason Gaming for supporting us throughout i49 despite us having quite literally no track record as we're a new team and to our sponsors SteelSeries for the awesome gear, eSport Clothing for the really nice shirts and IT Rentals for helping teams out where and when they can. Venum: Alright good stuff and maybe Dave will hear of this. And I will also pray for Dread not to give away any more first bloods as he gets enough grief because of his feeding! Goodluck with the tournament! 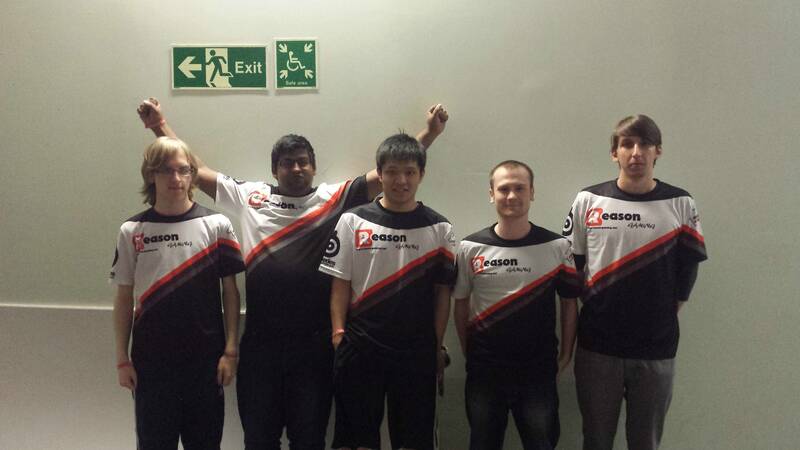 Reason Gaming Dota 2: Antab, DreadKnight, 1cHiGo_, Mute242, Infernokoi (left to right). Props to our Camera man, KingDave. We wish Reason Gaming the best of luck for the remainder!